In my life, I frequently find myself sitting in an artificial environment breathing dry, canned air that's pressurized against the unlivable habitat outside the tiny windows. The basics of life -- food, water and air -- all need to be carried in the craft, just like all the waste we produce in this artificial habitat needs to be contained because it's a long ways down for a cup of coffee and a bathroom break. Every pound of cargo and every inch of space is at a premium. There are mathematicians whose only job is to calculate fuel to weight ratios -- pack in as much as you can with as little extra room, and then calculate how much more fuel it's going to take to hurl this load of people and things through the atmosphere to distant destinations. And this is just an airplane. I can only imagine what space travel is going to be like. I don't think it's going to be like Heywood Floyd's trip to the moon in 2001: A Space Odyssey. First class to Europe doesn't have as nice of seats or as friendly of hostesses as the Pan Am space clipper. In fact, I feel it's a bad sign for space tourism that one of the most realistic parts of that movie was that Pan Am was the space liner, Pan Am being one of the first traditional airlines to die in the cost crunching years. 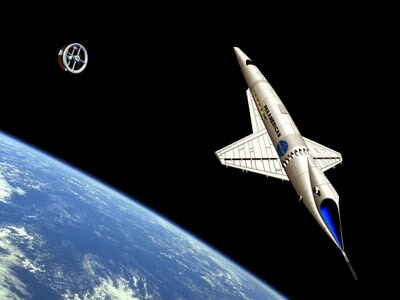 No, I don't think that Virgin Galactic is going to be like the space clippers of the movie 2001. I think they're going to be less luxurious than a 1969 Volkswagen microbus with 20 people crammed into it. If you're one of those folks who takes Airborne and doesn't turn on the overhead air on a flight for fear of catching a cold... space tourism may not be for you. Not only that, the whole point is to go into orbit and come back down again. It would be like paying a quarter of a million dollars to take an international flight only to find yourself back at the airport where you started. I'd probably get stuck with a seat over the wing, making the view not much different than from 30,000 feet -- wing below and blackness overhead. Or maybe an aisle seat so I get to see the back of the head of the guy looking at the wing and blackness. I'm not saying we shouldn't encourage people to go into space. I think the idea of seeing the Big Blue Marble from out there would be an amazing experience. I think what I'm really saying is that the word "Tourism" shouldn't really be associated with the word "Space." Actually, I think the real irony about space travel is how little space there seems to be in the habitats we take along with us into the infinite emptiness beyond the atmosphere. So, it's not "space travel" that makes me nervous about space tourism, but rather "Space Hospitality." I've seen what we do with expensive travel and limited resources and as long as my expectations are set by airlines and "luxury efficiency hotels," I think I'll keep my head below 40,000 feet.